You are here:Home » Euromil News » A Common European Defence Market – How to tackle Fragmentation? 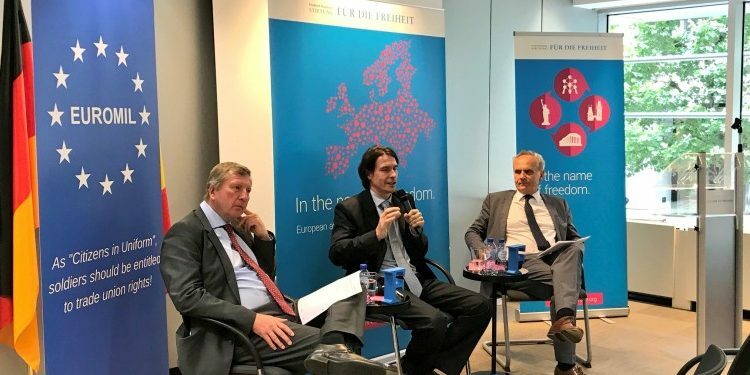 On 5 June 2018, EUROMIL, together with the Friedrich Naumann Foundation for Freedom (FNF) organised the third event in the series “Overcoming Obstacles on the Way Towards a European Army” dealing with defence industry cooperation in the European Union. Pierre Delsaux, Deputy Director-General of DG GROW at the European Commission was one of the panellists and explained why the European Commission is now actively dealing with the European defence industry: As the market is fragmented, the Commission identified a need for more collaboration in order to strengthen the market and make it more effective. In particular, research and the development of capabilities are the focus of the Commission’s funding proposals. Burkhard Schmitt, Defence and Security Director of ASD Europe explained that also from an industry point of view the Commissions proposals came at a good moment: In times where security challenges in Europe’s neighbourhood become ever more pressing, strategic autonomy of Europeans is key, while being totally or partly depended on others might not be a wise decision. The subsequent debate with the audience touched on a variety of different issues, such as the collaboration with third countries under the EU Defence Fund, the willingness of EU member states to commit to buy European-made products as well as the relationship with the U.S.
EUROMIL highlighted that defence industry cooperation is not an end in itself. The reason why we need defence industry cooperation in EUROMIL’s view really are the soldiers: Governments and industry need to make sure that those men and women who put their life in danger to serve under the European flag are protected and equipped in the best possible way. It is therefore worth to not only look at what industry can offer and what governments can afford – but to also look at what military personnel really needs.